Since the beginning of humanity, people have been bought, sold, and enslaved by other people. But one of the great collective triumphs of our world has been our ability to end slavery. Slaves themselves, along with people of faith, were at the forefront of challenging this evil practice. Born out of the belief that even one person trapped in slavery is too many, #ENDITMOVEMENT is a coalition of the leading organizations in the world in the fight for freedom, including The Salvation Army. Each of our amazing coalition partners are doing the work, on the ground, everyday, to bring awareness prevention, rescue, and restoration. Joined by students and politicians, nonprofits and Fortune 500s, END IT is each of us standing for what’s right until the number of men, women, and children suffering in silence moves from 40 million, to ZERO. In 2012, leaders from the very organizations in the world in the fight for freedom convened in Atlanta, Georgia, USA, bringing with them statistics and stories of the tens of millions trapped in slavery, presenting a staggering truth: most of the world knew NOTHING about the largest human rights issue of its time. Out of that Freedom Summit, The END IT Movement emerged as a vehicle for awareness. The first step in addressing a problem is to admit you have one. The goal was clear; to leave no hiding place for slavery to exist unseen and unchallenged. The people of the world would begin shining a light on slavery. Drawing a RED X on your hand may seem simple at first, but you’ll be amazed at the conversations it prompts with everyone from your boss to your barista; conversations that educate and inspire the people in your circles one by one. Afterall, action starts with awareness. The Salvation Army’s international strategic plan to end slavery includes Awareness & Trainings, Prevention & Outreach, Survivor Services & Recovery and Partnership & Advocacy. Find out more information at enditmovement.com. On behalf of my wife and I, we wish a wonderful Christmas to you and your family. Romania exists because of a vision made into reality almost 20 years ago, and we couldn’t exist without the support from our communities, partners, volunteers, soldiers and officers. What a wonderful gift and friendship. This year, 45 children to attend a camp in the summer, an educational retreat for our local officers, building projects at each of our 5 corps locations and missional outreach programs that help children and families around various communities. Also, we’ve successfully redesigned and launched our new website. As we close 2018, we look back at the year and thank God and you, our family. This year, we’ve been able to continue operating programs like our Night Street Team in Bucharest, our 2 Youth Community Centres (Geneza Programme), begin 3 new education projects for integrating Roma & Romanian communities in need, music conservatories at a few of our corps, a mobile soup team in Craiova and so much more. Recently, we had truckloads of shoeboxes delivered from a team from the UK and a local Craiova company, ArhiDesign, donated school supplies and backpacks, together providing gifts to all the families in each community we serve across Romania. For Christmas this year, we have a kettle ringing daily in one of our cities, and at each location will host a Christmas concert for the community. We’ve also launched our first year of Angel Tree in Bucharest, a partnership with a local private school that has their students & families sponsoring our angels, who are children from families in need and orphans. We thank God for this past year as we look forward to 2019, when we will also celebrate our 20th anniversary of The Salvation Army in Romania. We look back at the progress made and look ahead to continue expanding our ministry of Dragoste și Grija (Love and Care). Again, we would like to wish you and your family a wonderful Christmas and a blessed New Year. And thank you for your support! Keep up with us on Facebook, Flickr and armatasalvarii.ro. HOPE and transformation found in a personal relationship with Jesus are the hallmarks of General Brian Peddle’s first Christmas message as world leader of The Salvation Army. In his video address – available on his Facebook page (www.facebook.com/GeneralBPeddle), YouTube and downloadable from Vimeo – he speaks of Jesus, who he describes as ‘all about justice, righteousness and salvation’, being ‘right here with us’ as someone who gives ‘words of wisdom and guides us into truth’. The video message – which is intended for sharing with friends and family members – has been made available to as many Salvationists and friends as possible through the addition of subtitles. More than 15 languages are available, including Spanish, French, Japanese, Korean and Chinese, thanks to the support of colleagues around the world. The General has also recorded a New Year video message, which will be published on Monday 31 December. The Salvation Army Mobile Team delivered bags of Christmas gifts to the homeless shelter in Bucharest last night. Inside each bag were supplies for those currently living in the shelter and warm soup and coffee or tea. These individuals have a wide variety of stories and backgrounds who have found hope, refuge and warmth on these frigid nights in Bucharest. But best of all is knowing there are people who haven’t forgotten them for Christmas this year. The Salvation Army Romania is proud to partner with this shelter throughout the year, delivering supplies and providing a hot soup, coffee and/or tea. May God bless them and continue to share the love this Christmas. 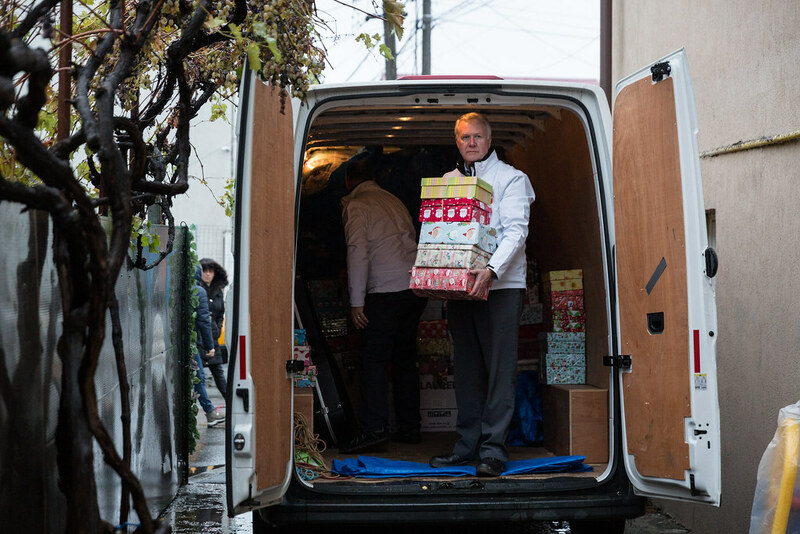 Every year a team of 7 drives 2 vehicles to Romania, full with shoeboxes for Christmas. 3500 miles and delivering to 5 centres. 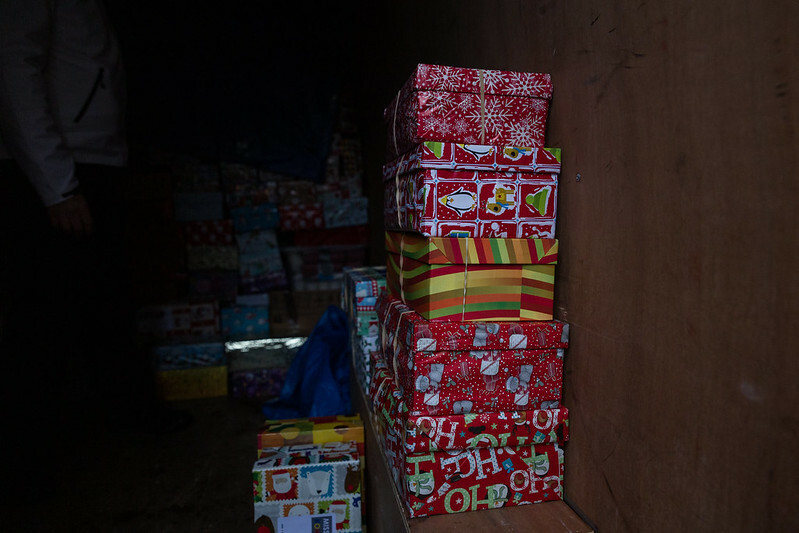 Each shoebox is donated and checked before delivering, ranging from infants to teenagers, boys and girls. The team had the opportunity to deliver directly to a few families in each community, while the remainder are at each corps waiting to be delivered to children by local volunteers and administration. All these items are given freely by various people from churches and organisations in the UK to which the team are extremely grateful to all who help. The team will also drop and deliver humanitarian aid which consists of mainly basic food items (Sugar, Oil Pasta, Rice, Cornflour, Biscuits) and warm blankets to aid them through the difficult and often cold winter months. Keep up with them and follow their Facebook Page.